The current price is 8.75p below the same week of 2017. Despite some recent uplift, prices on the continent also remain below year earlier levels and the current difference between the EU average price and the UK price is almost 24p in sterling terms. This price differential will likely make importing product an attractive option for processors and retailers. Throughputs increased week-on-week, by 4,000 head to total 191,000 head. This is the highest weekly kill since February and 10,600 head higher than the same week of 2017. The average SPP carcass weight fell for the second week in a row, by 350g to 84.18kg. 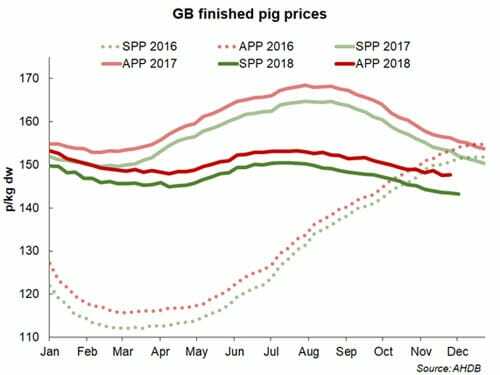 However, weights remain a kilo above last year’s levels, indicating fewer pigs are being pulled forward than last year. The average probe measurement was similar to the previous week at 11.3mm. The EU-spec APP for the week ended 24 November remained fairly stable on the week (up just 0.16p) and averaged 147.69p/kg. The current price is around 8.5p below last year’s price. The gap between the APP and the SPP in the corresponding week widened slightly, and is now 4.17p. The 30kg weaner price in the week ended 1 December averaged £43.55/head. There has been limited data for the 30kg weaner price recently, however the price has fallen by over £5/head since the last figure was provided in the week ended 10 November. Meanwhile, the 7kg weaner price fell slightly on the week, by £1.66 to £36.50/head.